Optus has partnered with the FlyBuys program to offer point hunters the opportunity to hunt for treasure troves of flybuys points on the Optus network. Coles, the co-owner of FlyBuy, has been been in partnership with Optus for the past few years, using a fragment of the Optus network for its own mobile prepaid plans. In essence, this new offer is an extension of the FlyBuys offers available to FlyBuys and Coles mobile customers — who’re indirectly Optus customers — aimed at a broader section of Optus customers. Details are still forthcoming concerning which group of Optus customers will be eligible for the new offer. Since the announcement of the new offer, there have been no updates on the Flybuys site regarding the Optus services that qualify customers to benefit. However, pointers from the current Flybuys offers for FlyBuys customers suggest that this new offer will not be available across the board for all Optus services, and that it’ll most likely apply only to long-term contracts. Coles announced the new deal to roll out the FlyBuys program across the Optus network in a closing remark during its half-year presentation event. During the event, the company promised offers to its members on several Optus broadband, mobile, and wearable products. But the company obviously played down the prospects of the FlyBuys-Optus deal, declining to offer further details about the actual Optus services the deal will apply to. As stated, the Flybuys site hasn’t offered any updates on the new offer. Despite the lack of details on the FlyBuys site, it’s clear that Optus now offers a deal to FyBuys customers. The deal allows selected FlyBuys customers to earn reward points on new Optus Phone plans. 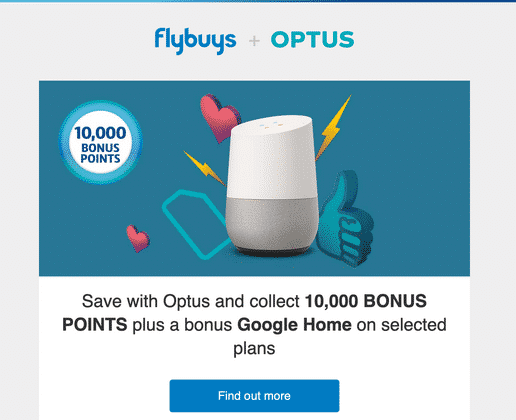 With this offer, selected customers are rewarded up to 40,000 bonus FlyBuys points and a free Google Home when they sign up for an eligible Optus mobile plan. Eligible customers are sent emails containing the details of the offer and a link to an Optus FlyBuys landing page, which redirects them to the order page of eligible Optus Postpaid Mobile Phone or Broadband services. Customers who sign up for this offer will then receive their Google Home within 14 days via their chosen email address, and then receive their FlyBuys points within 30 days after the successful activation of the new service. The deal rewards chosen FlyBuys customers who sign up for a new My Prepaid Ultimate Service, and recharge $30, with 3,000 FlyBuys points. Also, chosen customers who sign up for a 12-month SIM Only plan are rewarded with 5,000 FlyBuys points. A whopping 20,000 FlyBuys points is awarded to selected customers who sign up for the 24-month My Plan Plus contracts, which includes a phone. Presently, 2,000 FlyBuys points qualify you for a $10 shop discount at Coles and partnered retailers, including Kmart and Target. That implies that customers can qualify for up to $200 worth of discounts by signing up for the offer. Customers can also convert their FlyBuy points to frequent flyer rewards, where 2,000 FlyBuy points convert to 870 Velocity Points and 10,000 FlyBuy points translates to 4,000 Etihad Guest miles. Will this new deal really be worthwhile? There’s need for cautious optimism going forward. While this type of deal often features in the playbooks of mobile service providers, it’s usually short-lived and hardly makes any historic impact. For instance, Optus once offered customers the opportunity to earn Qantas points, but closed the opening in 2015. 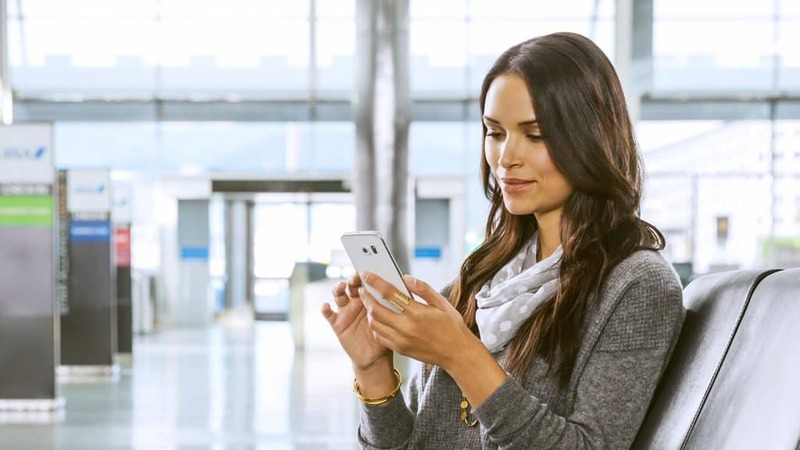 Vodafone also once chose to offer its customers the opportunity to win Quantas Points on some of its mobile plans. And as it stands, complete details of this new deal are yet to come. This news should be approached with cautious optimism given that plans available in the current market are always subjected to frequent changes. This makes long-term contracts less advantageous than short term plans because long-term contracts don’t give you the flexibility to switch to plans that currently suit you best. As such, you might have to make a trade-off between the flexibility to switch between different plans and the FlyBuy points available in long-term contracts. All deals are worth checking out, and this is no different. The Optus-FlyBuys deal may provide some great benefits for members if it actually turns out to be real and long-lasting. The point-to-discount conversion seems very fair, making the deals seem entirely worthwhile. However, some skepticism exists given the lack of complete details so far on the FlyBuys website, especially when an offer has already been announced. These types of deals hardly ever last, if they are implemented at all, and so the skepticism is real. However, if it does pan out, this may turn out to be a very attractive deal for FlyBuys members on Optus plans.